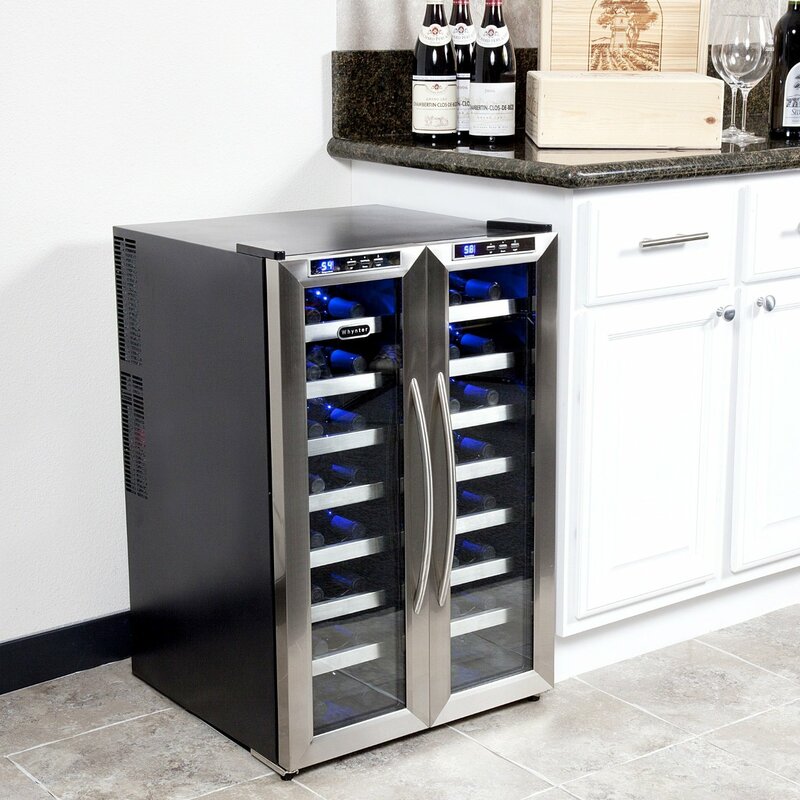 Finding a free standing wine cooler that’s dependable, keeps temperatures consistent, is quiet and looks fantastic is hard. There is no perfect wine cooler, but there are plenty that do a really great job at storing your wines at their optimum temperatures. If your main concern is how it will look once set up in your bar, dining area or kitchen, then this list is for you. There are a lot of attractive options on the market. How good your wine cooler will look in your home depends on the interior design of the room you put it in, where in the room you place it, and your personal preference about what makes a wine cooler look goodin the first place. We feel this top-four list includes the most attractive wine coolers available. They vary greatly by capacity, type of cooling system, single or dual temperature zones, and brand, but each of these units looks exceptional in their own way. This smaller mid-sized cooler has a fairly standard set up. It’s not necessarily extravagant or totally unique, but it has a very balanced, high quality look that makes it very appealing. 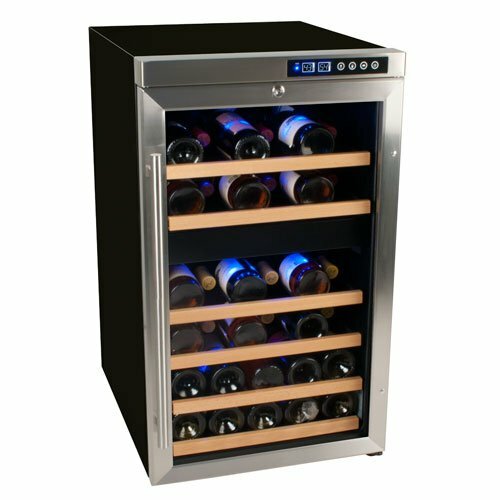 It’s the quintessence of what a nice wine cooler should look like; a stainless steel trimmed door with tempered glass, classy wooden shelves, a long stainless steel rod door handle, and a blue LED light to illuminate the inside. The door comes with a safety lock. There is a control panel on the front with a blue LED temperature display to match the lighting. The wooden shelves are fit for standard 750ml bottles and are removable in case you would like to store oversized bottles in them, but it comes with two plastic shelves designed to fit larger bottles anyway. If the majority of your wines are standard sized, the two plastic shelves should be plenty of space for any other bottles you may have. Make sure to put it somewhere with space for the door to open 180 degrees as you will need to actually pull out the rack to load or unload a bottle. 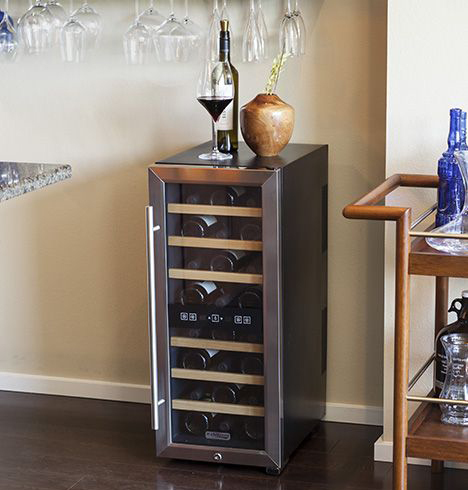 For around $260, the attractive Koldfront 24-bottle wine cooler is a very good deal. NewAir’s AW-321ED model features French style dual doors, meaning you can access one of the two temperature zones without disturbing the other. It has a quiet, vibration free thermoelectric cooling system. Its contemporary design includes wooden pull-out shelves and stainless steel doors. It fits 32 standard bottles tightly, so if you have larger bottles, you’ll need to take out a shelf. LED lights illuminate the interior. The front has an LED digital display showing the inner temperatures as well. The NewAir AW-321ED costs approximately $500, which is a very reasonable price for such a fine cooler. 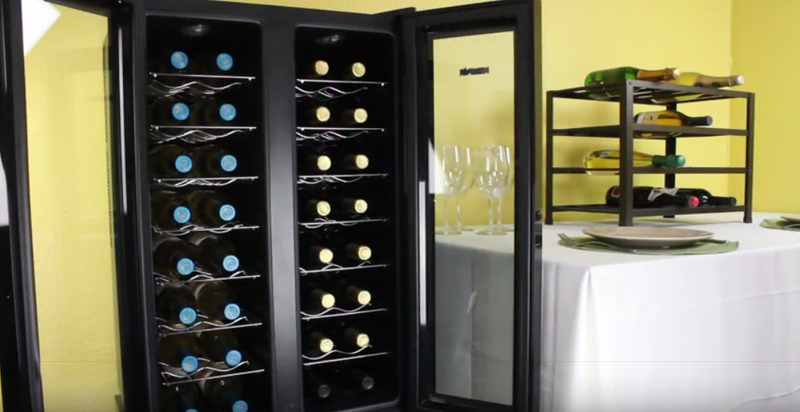 EdgeStar has some great looking products, but this 34-bottle cooler may be their most attractive. It utilizes a compressor based cooling system that keeps each temperature zone accurately. Its reversible door has a towel bar handle and a built-in security lock. The front is trimmed in stainless steel, which makes the cooler appear high quality. Its wood trimmed wire shelves are non-adjustable and fit standard bottles neatly. Most larger bottles will be hard to fit properly. As can be expected, the interior features LED lighting. The EdgeStar 34-bottle cooler runs fairly quietly. Compressors make a tick sound when they switch on, but other than that, it can’t really be heard unless you’re standing quite near it. The included security lock ought to give you some peace of mind for when you’re not around. The price for this EdgeStar cooler is around $420. This sleek stainless steel wine cooler from Whynter has French style doors, keeping the zones completely separate. Each zone has its own LED temperature display just above the door. The wire slide-out shelves are trimmed with stainless steel and are removable. It’s all stainless steel design has a solid, industrial grade look. Soft LED lighting makes the interior glow blue when switched on. It features vibration-free thermoelectric cooling, and for around $520, this is a great option.